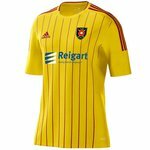 Cowden match rescheduled | Albion Rovers F.C. Our trip to Cowdenbeath has been rescheduled for Tuesday 19th Feb with a 7.45 k-o. Originally postponed due to their cup tie which was also postponed! Games coming fast and furious in February and by the end of the month it's likely that our fate will become much clearer by then. The odd draw here or there wont be enough and I think 2 wins should be the goal as a minimum. The hard luck, we were robbed, at least we are getting better stories won't suffice anymore. For the manager more than anyone I hope a win comes sooner rather than later.